Every serious birder with several years experience has had one or two extraordinary birding encounters he or she is reluctant to share with anyone, more particularly fellow birders rather than strangers, because they are certain not to be believed. Bird stories have a way of mutating with the tellings and the years, somewhat like fish stories. Species involved become rarer, the weather becomes worse, the circumstances more outlandish. And, of course more often than not, there are no witnesses. Like most birders, I have one friend whose veracity over the years has become more and more questionable. When he starts going off about his latest great adventure, I go into autopilot mode, nod, smile a lot, and put on my dark glasses to hide my rolling eyeballs. I may have to apologize to him now, because I recently had one of those once-in-a-lifetime birding experiences happen to me. I had a close encounter with “Elvis.” Let me explain. Elegant Trogon is the quintessential Arizona bird. It is a parrot-sized bird, often mistakenly called a parrot by the uninitiated, that reaches the northern limit of its range in the canyons of the Sky Islands of southeastern Arizona. The male of the species is a spectacular riot of color more reminiscent of birds found in the tropics than those of North America and, indeed, the center of its breeding range is Central America where we have seen them in the Guanacaste region of Costa Rica. The Elegant Trogon is a thirteen inch bird, half of that total length its long, broad tail--metallic copper on the upper, or dorsal, side and banded gray, black, and white on the under, or ventral, side. Formerly known as Coppery-tailed Trogon, the male is iridescent green on the back, head, and face, bright scarlet on the belly and undertail coverts, and has gray wing coverts, a white chest band and a bright yellow bill. “Elegant” describes this species very well. Every spring and summer it draws birders by the thousands to the canyons of southern Arizona to see it, the only place north of the border it can be found. Birders who are unfamiliar with the species and make a special trip from across the country to add it to their list often miss it, and they assume it is a shy and reclusive bird. This is not the case. 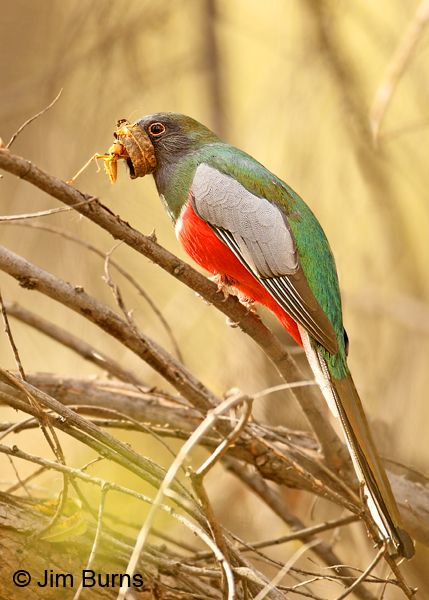 Trogons are easy to miss in Arizona simply because there are so few of them in this country, in a typical year certainly no more than a hundred spread out over canyons that are largely inaccessible. Once located, however, trogons are actually quite tame and “confiding,” a term birders use to refer to a bird that hangs around for awhile affording long leisurely looks. Most trogons head south into Mexico for the winter, but very occasionally one stays throughout the year. Even rarer is one that is loyal to a specific overwintering area for several years. One such male has been recorded in winter at Lake Patagonia State Park and bordering state trust lands for at least twelve years. I first photographed him in January, 1999 and then wrote him up in an article for the December, 2004 issue of Birder’s World Magazine. 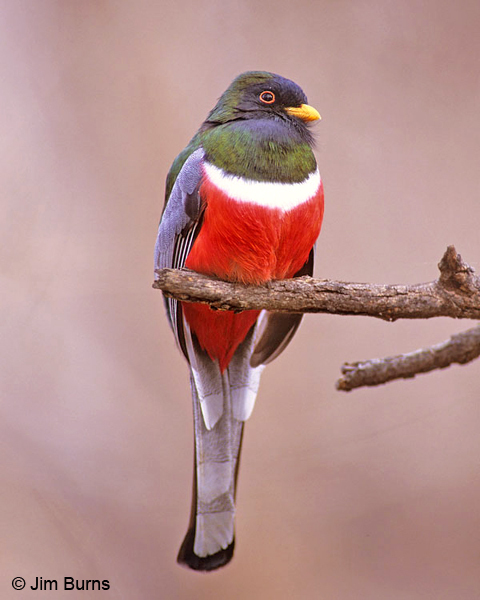 I have dubbed this male Elegant Trogon “Elvis” in honor of the Velvet Elvis pizza kitchen in the nearby ranching/artisan community of Patagonia, Arizona. I get down to Lake Patagonia State Park (LPSP) for birding once or twice every winter, not specifically to see Elvis any more, but because many interesting and unusual avian visitors from the north and east show up. Half the time I see Elvis, half the time I don’t. Let me set the scene for you. LPSP, about ten miles north of the border, is the jewel of Arizona’s state park system. It sits in rolling hills between Patagonia and Nogales, its central feature a 265 acre man-made fishing lake surrounded by a large campground and a few hiking trails. Adjacent to the east side of the park is a large parcel of state trust land, mostly cottonwood/willow forest and mesquite bosque cut by the braided Sonoita Creek which empties into Lake Patagonia. The area is accessible to hikers and birdwatchers who can explore several miles of rough cattle track meandering over, across, and through the creek. The very best way to look for Elvis is to wear warm socks and rubber boots or old tennis shoes and slosh right through the ankle deep water carefully skirting the thigh deep holes. Early last December along Sonoita Creek on an unseasonably warm day under a high overcast Elvis found me. That’s the way it typically happens with trogons. In their summer canyons the males often announce their presence with their odd, hollow, somewhat ventriloquial territorial call which has been likened to the sound of a small dog barking. Males in winter, though, are mostly silent, and the state trust land encompasses several hundred acres—needle-in-a-haystack stuff if you’re looking specifically for Elvis. I am sitting creekside on a rock watching and listening. My camera, telephoto lens attached, is on my tripod next to me. I catch movement in the corner of my eye and see the trogon thirty yards away across the water. Unfortunately my footwear this morning is not conducive to wading the muddy, flowing creek with twenty pounds of camera gear on my shoulder without courting disaster. I say a silent prayer that he will cross to my side. He answers my prayer. I follow him, now on my side of the creek, for almost an hour as he roams around making his rounds, mostly sallying down to the ground to take large yellow grasshoppers. I keep a respectful distance, though he pays me no mind as he hunts through the cottonwood forest for breakfast, trending downstream toward the lake. Having taken many images of this bird over the years, I am content this morning just to follow and observe a day in the life of Elvis, knowing he has become comfortable with my presence and I can begin shooting if something unusual happens. It does. He is twenty yards out at eye level, sitting on a small branch, scoping nearby willow bushes and the leaf litter beneath his perch. I once described the Elegant Trogon hunting style as “vireo on valium.” Trogons sit for minutes on end turning the head VERY slowly this way, then that, tuning in visually to insects and fruit often perfectly camouflaged to the human eye, then sally out or down and pluck, sometimes hover plucking. The capture is with the bill, so patient and precise in the hunting, or gleaning if you will, that I have never seen a trogon come up empty. Elvis hasn’t this morning. He drops to the ground again, comes up with his next grasshopper, then flies directly toward me, passing at eye level over my camera lens. He passes so close I flinch as he rises to go over me, then I pick up the tripod and prepare to follow, camera and lens hanging over my left shoulder, tripod legs extending out horizontally in front of me the way I always carry them. As I turn, he is pulling up to a branch not ten yards away but, inexplicably, he loses his grasp on the insect which then falls into the leaf litter literally at my feet. He hovers momentarily, at eye level almost within arm’s length, searching for the grasshopper, then lands on the nearest horizontal perch—one of my tripod legs! He is twelve inches from my left hand which is holding the leg he has chosen. He looks at me. I look at him. “Tame and confiding” indeed! I am close enough to touch a breathtakingly beautiful and wild creature people come from all over the world to see and often can’t even find. I try not to breathe, realize I am starting to shake, then make a conscious effort to begin breathing again. He looks down for the grasshopper. I look around for someone--anyone, a hiker, another birder--who might verify what no one will ever believe. There is not another human being within two miles. He is still searching visually for his lost prize. Even though I know trogons weigh in at only three ounces, counter intuitively I think I feel his weight on the tripod leg. Thinking I might somehow capture this image, I fumble for my cell phone in the side pocket of my cargo pants, inadvertently leaning slightly. The tripod leg is slick compared to tree bark, and my slight movement causes him to slip and then rebalance. I stop breathing again, straighten up, and forget about the cell phone. He looks down again. I look down, following his gaze. The leaf litter, dead and drying cottonwood and willow leaves, is all light greens, yellows, and browns. I cannot discern the grasshopper but keep looking anyway, ridiculously imagining that if I can pick it out of the forest detritus it will somehow help him find it. This search, this joint search, goes on for fully sixty seconds. I am exploding inside my skin. I am tearing up. Disbelief. Joy. Exhilaration. Frustration. This is my brain on pure adrenaline. I whisper to him softly, but I have no knowledge of what I am saying. Somehow I barely resist the temptation to reach out and try to touch him. Finally he spies the grasshopper, drops to the capture, then flies with it to the branch he had originally chosen. I breathe again and find I am shaking uncontrollably. No matter, the bird is too close to focus with my 600mm lens anyway. Carefully I set the tripod down on the ground and sink to my knees. I am smiling so hard my face hurts. I no longer care that there are no witnesses, nor that I have not gotten a picture, nor that I have just had an encounter with nature that stretches credulity. This is just Elvis and me, a moment with a trogon no one else will ever know, a bond with the natural world no one else will ever have. This is why I am a birder. This is why nature is my cathedral. Elvis flies to the next tree. I arise shakily and look through the lens. He is there, filling the frame, the grasshopper wrapped in a willow leaf which he has inadvertently picked up with the insect as he snatched it from the forest detritus at my feet. I focus and press the shutter button. He flies off. I sink to my knees again, no longer shaking but weeping uncontrollably.